AUCKLAND, New Zealand - Auckland City FC's 4-1 win over Canterbury United signals a bright future as a new generation of Navy Blues take centre stage. Reid Drake, Alfie Rogers, Yousif Ali Al-Kalisy, All Whites duo Te Atawhai Hudson-Wihongi and Cam Howieson, combined with Dylan Manickum have shown in recent weeks how ready they are to take major steps toward driving Ramon Tribulietx's team forwards. Curiously, it was the visitors who fielded more foreign players with no less than six of the Dragons starters from either England or Canada. Seven of the Navy Blues starters were from New Zealand, including two All Whites in Howieson and Hudson-Wihongi. Only three of the squad that featured in the Navy Blues astonishing bronze medal win at the FIFA Club World Cup in Morocco in 2014 were involved in today's game - Mario Bilen, skipper Angel Berlanga and veteran Takuya Iwata, who came off the bench, illustrating the arrival of a completely new generation of talent is ready to take centre stage for Auckland City FC. The 4-1 win over Canterbury flattered the visitors in the end and, given there was no Albert Riera, Fabrizio Tavano, Brian Kaltak, Micah Lea'alafa or David Browne, Tribulietx was delighted with the way some of his new signings have stepped up to the plate while others who have been around for a few years are now starting to take a grip of a first team shirt. FULL TIME - #NavyBlues come from behind to defeat 10 man @CU_Dragons 4-1 at Kiwitea Street to maintain our perfect start to the season. "We know how hard a game with Canterbury United can be - it can be difficult, aggressive and physical. The state of the pitch didn't help us and combined with their qualities they took their first chance of the match but the red card changed the game. "It would've been interesting to see how things would've transpired had it remained 'eleven v eleven' but we dominated completely against ten and it was a matter of understanding how to break them down after that. "We were better between lines in the second part of the first half. We went from three to two holders with the ball to have one more player between the lines and it paid off because we created so many chances to score after that. I was also very happy with the way we came back from a goal down," Tribulietx told www.aucklandcityfc.com. Particularly pleasing to the eye was Manickum who scored his third goal for the club following his winner against Eastern Suburbs in last week's Gridlock Derby. The New Zealand Futsal international was a standout today. "That's why we brought Dylan to Auckland City FC. We've always understood that Dylan has the qualities to play football for this team and coming from another club that played direct football, he had to understand his positioning better and he's doing that. "At other clubs teams are used to counter attacking and used to playing into spaces and when they come to us they have to understand we often have no space. "Dylan has had to understand where the space is we want to use to benefit from his abilities to turn forward and attack or connect with other players. "Sometimes Dylan is too eager to get to the ball and he gets out of the pockets we want to exploit but he's improving his understanding all the time and it's great to see him delivering a quality product on the pitch," he added. Now a regular starter, Drake managed to score Auckland City FC's third and Tribulietx was happy with his contribution. "I love players like Reid Drake. He's been very patient and been with us for four years and not always played as much as he wanted to but his attitude has always been excellent. He's an example of how you have to persevere and wait for your opportunity. "Reid is maturing and getting more minutes, he's improving, he's getting tested, he's getting used to dealing with physicality and working in small spaces. Teams can be physical and get away with it and so as a midfielder he's learning how to deal with that. "In midfield, you've got less space to work in and Reid is learning this and getting better at it. He's always had good understanding of the way we play and tactically he's very astute," he added. Tribulietx's team now hit the road with three away games before the end of 2018 and their first match of 2019 pits them against Super City derby rivals Waitakere United on January 6, also an away game, this time at Trusts Arena. 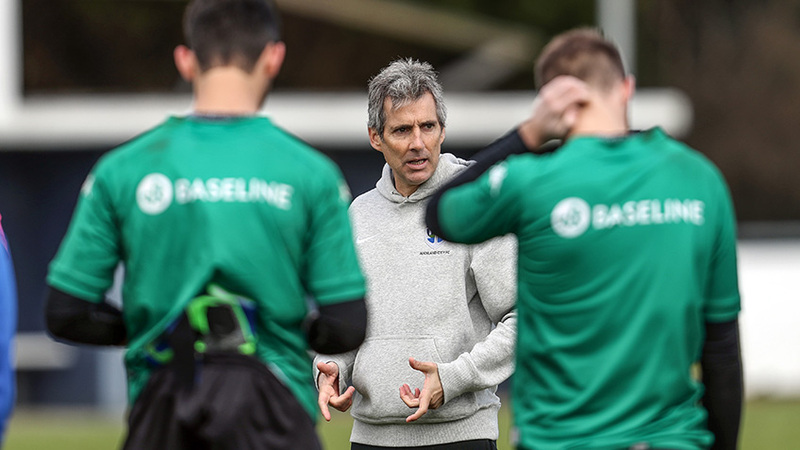 What will drive Tribulietx forward, though, will be the thrill of just where his Auckland City FC side can go with the youngsters on show and he had time to point out the contribution of Vale, Rogers, Al-Kalisy and McHenery. "Jordan is very versatile - he can play out wide, in the middle, and he always delivers you a seven or eight out of ten, he's a very steady player. He is always a secure bet for any coach. Today's match is proudly brought to you by #NavyBlues sponsors Fresh To Go. "I was very happy for Hayden McHenery getting pitch time and also Yousif Ali Al-Kalisy did very well last week and had to wait today, For the 15 minutes he had, he did well with the ball and it's great to have these players coming through. "Players like Alfie Rogers are getting older and more mature - Alfie was very good today, very close to perfection with his positioning on the ball. A lot of the players in this team are reaching maturity of the 24-25 years of age which is when you start to put your hand up and say yes, here I am, I can do the job. "You have to remember we're missing players like Albert Riera, Fabby Tavano, Micah Lea'alafa, Brian Kaltak and David Browne. Regardless of who we have on the pitch we can still play the style of football we believe in. "Time will tell where we can get to with this squad," he said.